Donna-Marie Cooper O’Boyle is a Catholic author, a radio and television host, and an inspirational speaker known and admired from coast to coast. Yet with all of her public exposure, she has revealed very little about her personal history, that is, until now. When she discovered that sharing her struggles gives encouragement to others, she was persuaded to write this story of her life. Growing up in a Polish-American Catholic family, Donna-Marie was blessed with hard-working parents who provided a stable home for their eight children. At times her childhood was golden and carefree, but other times it was tarnished by pain that she felt was best left unspoken as she sought God for help and strength. After she left home after high school, her path took some harrowing turns. A Vietnam veteran fiancé snapped and held her against her will. She suffered pregnancy loss, serious illness, divorce, and single motherhood. Perhaps her greatest trial was an epic custody battle in which she needed to defend both her reputation as a mother and the safety of her five children. Yet through all the dark valleys, Donna-Marie kept the fire of her faith burning. Helping her to see the beauty of the crosses in her life, and to rely on the presence and the providence of God, were saintly souls who became her friends and mentors. One of these was Blessed Mother Teresa, who was her confidant and spiritual mother for ten years. "This candid and poignant account pierces the heart and leaves the reader changed." "A courageous, sometimes stunningly personal memoir. Donna-Marie reminds us that everyone gets a turn on the via Dolorosa." "Allows us to enter into her heart, and accompany her on a remarkable spiritual journey." "A gripping spiritual adventure telling of God's faithfulness in times of terror and abuse." "Runs the gamut of virtue and vice, flesh and spirit, demonic and holy. Her extraordinary life gives hope to all." "This book knocked my socks off! I never expected that such a sweet, joyful, and soft-spoken woman lived such a perilous life." "If you have ever doubted that God draws straight with crooked lines, you simply have to read Donna-Marie’s story!" "For anyone who wishes to move beyond anger and resentment, this book is an answer to prayer." "An inspiring roller coaster story about a life devoted to Jesus and his Church that encourages us to make courageous choices in life." 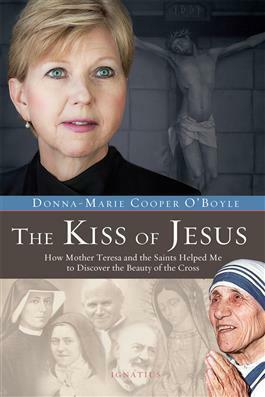 Donna-Marie Cooper O’Boyle is a Catholic wife, mother, speaker, catechist, and EWTN TV host of “Everyday Blessings for Catholic Moms” and “Catholic Mom’s Café.” She is an award winning and best selling author of numerous Catholic books and was blessed with a ten-year friendship with Blessed Mother Teresa of Calcutta.